dixoide smoke inside pop on either a towel, bubble glove or a table​? Hypothesis: ​Our prediction is that when the bubble is placed on a towel or held with bubble gloves it may not pop, but if placed down on a table it has a higher chance of popping. This is because of the type of surface materials and particles on the different surfaces. ​This is what the boo bubbles look like when finished with the process. Material 1. Dry ice can easily freeze veins and damage skin. Dry ice should never come in contact with skin. Always use protective gloves when handling dry ice. 1. 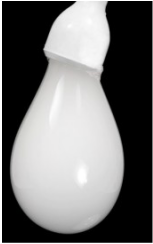 Fill 1/6 of 2 liter bottle (Part of the generator) with warm water and add a few pieces of dry ice. 2. Put the funnel over the hole cut in the two liter bottle. 3. Place the tube over the hole in the 2 liter bottle. You will observe that smoke like substance comes poring out of tube. 4.Dunk the portion cup into the bubble solution you made and cover top of bottle and watch what happens. 5.When the bubble reaches perfect size, gently shake it off the portion cup and it will quickly fall to the ground (its heavier than a normal bubble because it is filled with carbon dioxide gas and water vapor). 6. When bubble hits table, watch what happens to the bubble. Water is needed for the experiment. How the bubbles are made-Dry ice is frozen carbon dioxide.when you drop it into warm water you get a cool combination of carbon dioxide gas and water vapor that bubbles out of water. The gas in the 2 liter bottle becomes too much volume to contain and the dry ice smoke flows over. By capping it with the funnel the smoke builds pressure and is forced into the tube. This pressure pushes the smoke through the tube creating a flow of smoke that fills the bubble. We look forward to figuring out what type of surface will prevent the bubbles from popping the longest. From our research, we know that stuff like oil and dirt will pop the delicate surface of a bubble. More concluding information to follow once we have completed our experiment. My name is Ciara. I'm 10 years old. I'm in fifth grade in Mrs. DeBellis' class. I love the color blue and my favorite animal is a Dolphin. I like science because I like trying new experiments, to see what happens. My name is Ava. I'm 11 years old. I'm in fifth grade in Mrs.DeBellis' class. My favorite color is yellow and favorite animal is a Bear.I like science because I like to figure out the unknown. My name is Isabella. I'm 11 years old. I'm in Mr. Benedetto's class.At home I like to draw my favorite animal Dolphins and my favorite color is magenta . I like science because you can try new experiments and figure out questions.